You need to have an administrative account on the Mac computer to start R-Studio Agent for Mac . 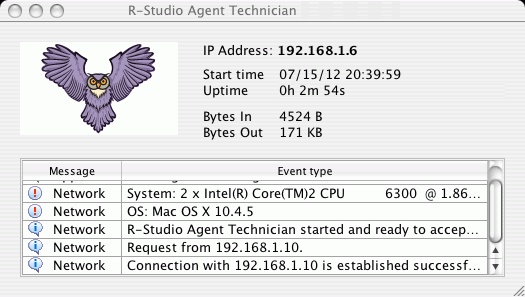 R-Studio Agent should be installed on a network computer to enable R-Studio access to its drives. 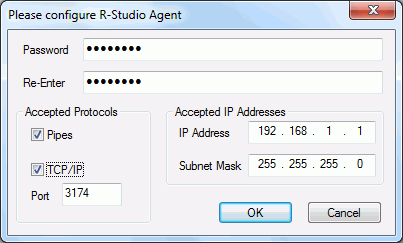 R-Studio Agent should be registered. If, due to file system crash, the network computer where you are going to recover your data cannot start, you may use R-Studio Agent Emergency to start the computer. If this option is selected, R-Studio Agent will accept incoming connections. Connecting from R-Studio Agent for Mac to R-Studio. > R-Studio Agent for Mac will connect to the computer where R-Studio is running and it will show the hard drive and logical disk structure of the remote computer. way as that on a local computer.